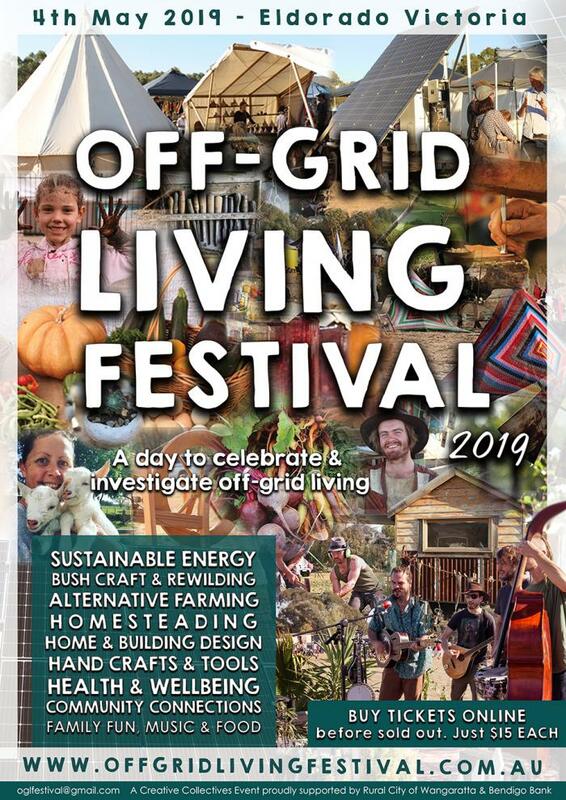 The Off-Grid Living festival is grassroots event in Eldorado Victoria, showcasing a diverse array sustainable, off-grid living ideas. Attracting thousands of people from all walks of life to celebrate and investigate off-grid living together. The day offers a unique opportunity for attendees to meet people with vast experience from a variety of off-grid living areas ' from the latest sustainable technology gurus and eco-builders, to the low impact famers and traditional craftspeople. Participants leave this festival feeling uplifted and inspired to make positive, sustainable changes in their own lives, with new skills, products, information and contacts to help. Enjoy info & advice from friendly exhibitors, talks, workshops, demonstrations, off-grid food & entertainment and family fun, and connect with a like-minded, sustainable community who thrive off-grid. There will be so much to see and do, be sure to arrive early as this will be a FULL day of activities.